topolBy inserting a phase-shifter plate in one of the two beam paths in the neutron interferometer (either I or II) the phase relation between the two sub-beams can be systematically varied. Here, we discuss several aspects of phase shifters in various configurations. situations, although a decoupling is possible, see ‘dispersion cancelation‘.The phase shift depends on the change of the wave vector component perpendicular to the phase shifter surface, and on the phase shifter thickness, which is illustrated below. The wave vector is denoted by outside and inside the phase shifter respectively. and This relation can be used to determine the neutron coherent scattering length which is a key parameter for most neutron scattering experiments. denotes the atom density and the sample thickness. For the spatial displacement we consider as the central component of a wave packet. The group velocity equals . Inside the phase shifter the wave length increases, the normal wave vector decreases and the velocity as well. When the wave packet leaves the phase shifter at point an unperturbed wave packet would already be at point , since . It follows that . Phase shift and spatial displacement are related by , which is reported in 1.
where denotes the reciprocal lattice vector perpendicular to the lattice planes. Bragg’s law is fulfilled for any wave component parallel to the lattice planes but only for a single component perpendicular to the lattice planes. The meaning of ‘single’ is given precisely by the dynamical diffraction theory which yields . In contrast, is given by the beam preparation in front of the interferometer and is usually in the order of a few percent. By aligning the sample perpendicular to , i.e parallel to the lattice planes, only the well defined enters into the phase shift. The wave length of the incident beam is effectively replaced by (twice) the lattice constant of the crystal 2. Methods for the precise sample alignment are given in 3 and 1. In addition to the phase shift both sample geometries create a spatial displacement of the wave packet.This reduces, in principle, the wave packet overlap at the interferometer exit and thus the visibility of the interference fringes. In the standard geometry, the displacement is parallel to the beam, equivalent to a time lag. 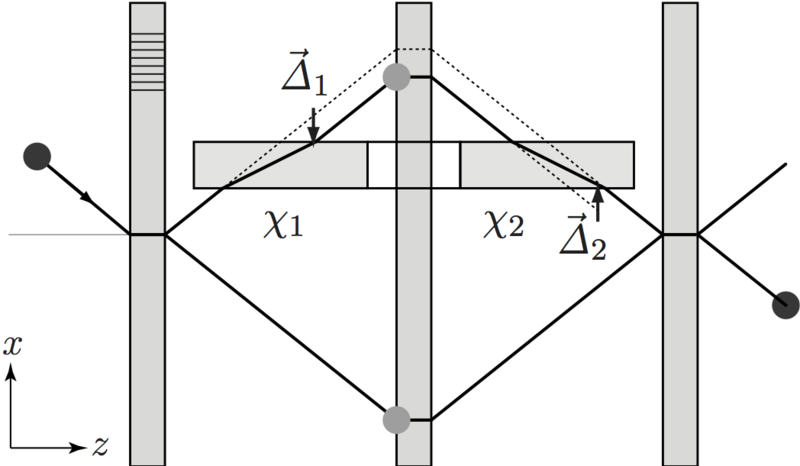 In the non-dispersive geometry, the displacement is perpendicular to the lattice planes, equivalent to a de-focusing of the interferometer loop. However, for thermal neutrons this problem is negligible, since the displacement is much smaller than the coherence length of the beam. combinations of doubling and canceling phase shifts, spatial displacements, dispersion etc. 1. Of special interest is the setup consisting of two samples in non-dispersive geometry, one before and one after the mirror blade. 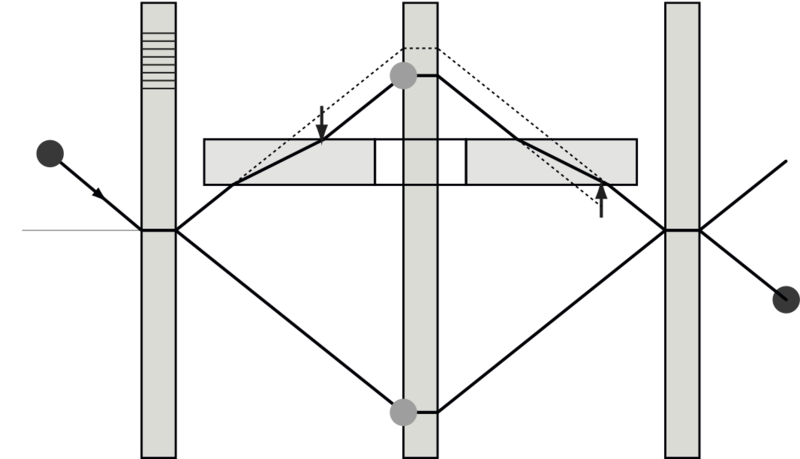 The lateral displacement of the first sample is reversed by the second, and both beam paths of the interferometer reach the third interferometer blade at the same point. In addition, the velocities parallel to the lattice planes are not changed throughout the setup, and thus the wave packets from both beam paths reach the third blade simultaneously. The interferometer is always fully focused however thick the samples become. Still the phase shift of both samples sums up and does not vanish. Why are phase shift and spatial displacement de-coupled in this setup? It can be explained by ‘odd-order dispersion cancelation’. To understand the non-dispersive dual phase shifter we need several ingredients. i) The phase shift created by a sample depends on , i.e. the wave length. Consequently, each component of a wave packet obtains a slightly different phase shift. In the non-dispersive sample geometry the distribution equals the distribution created by Bragg diffraction on the interferometer crystal. It is given by the Laue reflection factor . A typical distribution is depicted below. The central wave component is given by Bragg’s law. For thermal neutrons the distribution is very narrow, .